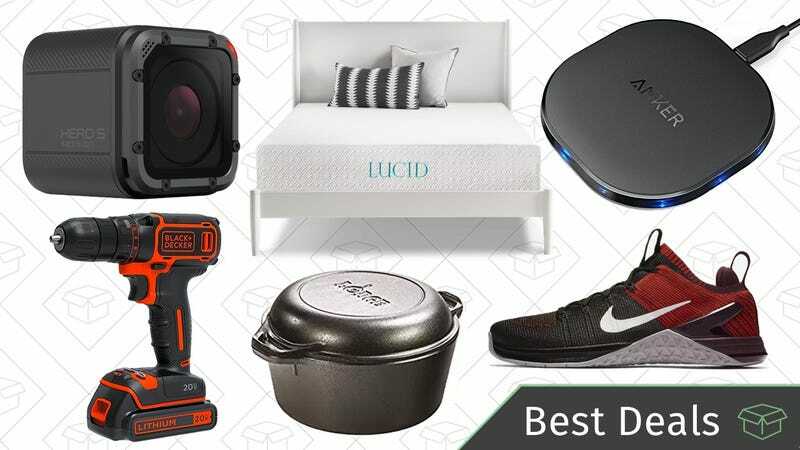 A Nike sale, a Lodge dutch oven, a Lucid foam mattress Gold Box, and many more are all part of today’s best deals. If you missed the one-day Echo sales last week, Amazon’s once again taking $70 off the Echo Show today, bringing it back to within $10 of an all-time low. You can read Gizmodo’s review if you want to learn more, but it turns out Alexa would have benefitted from a visual component all along. Promo code PREPSPRING will take 15% off nearly any $25+ eBay order (gift cards, real estate, and actual money are excluded, sadly), with a $50 savings cap. That includes everything from video games from Best Buy’s eBay outlet, to Nintendo Switch consoles, to Dyson vacuums, to PlayStation Plus and Xbox Live memberships, to that rare vintage comic book that you’ve been eyeing. Need a lot of extra space for your Nintendo Switch, GoPro, or smartphone? SanDisk’s massive 200GB microSD card is back down to $60 on Amazon today, the best price we’ve seen outside of a one-day Gold Box deal. I can’t say I personally understand the appeal, but I’ve read our comment sections long enough to know that there’s a very dedicated fan club out there for trackballs. This wireless model from Kensington is down to an all-time low $59, and includes a scroll ring around the ball for scrolling through web pages, plus a detachable wrist rest for comfort. Despite its tiny size, the GoPro HERO5 Session includes 4K recording and voice commands just like its bigger sibling (though obviously, it lacks a touchscreen), and you can get a refurb from GoPro’s official eBay storefront for just $120 today. That’s a full $80 less than buying it new, and you get the exact same manufacturer warranty, so I’d say it’s $80 well saved. A decent drill is something everyone should own, and this 20V Black & Decker is a great deal at just $35 in today’s Amazon Gold Box. Typically selling for $40-$60, the drill only weighs 2.5 pounds, and carries a solid 4.4 star review average. Bonavita makes our readers’ favorite coffee maker, so it’s only logical that they would make a great electric kettle too. This Bonavita’s gooseneck-shaped spout provides more control, which is especially helpful when making strong, yet smooth pourover coffees. Today’s price is just 50 cents away from Amazon’s best price ever. Plus, using it will make you look like a barista at a fancy coffee shop, no mustache required. For a limited time, Amazon’s taking $10 off the brush’s $30 price tag. We’ve seen this $10 coupon before, but it’s usually subtracting from a $35-$40 starting price. Just note that you won’t see the final price until checkout. Today only, Amazon’s shaving the prices of two popular Philips Norelco products. First, the Multigroom is a trimmer designed for trimming your beard, managing your stubble, and even shaving your body hair. With a pivoting head and a built-in comb with five length settings, it’s a jack of all trades. Get it for $40, down from its usual $60-$80. For a razor-close shave, check out the Norelco 8900 with SmartClean, down to an all-time low $126 (from a usual $180-$200). It comes with a click-on five length beard trimmer, and a base that cleans, lubricates, and even dries the shaving head while it charges.